Since life now revolves around our son, I always have him in mind when I am making meals for the week. 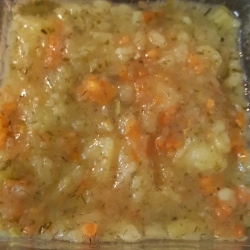 I introduced some mashed foods the last two weeks (banana, avocado, sweet potato), and I decided to go for a comforting chicken stew; all the veggies get nice a soft and we can smash them up for him. It is also a really yummy way to introduce potatoes (yukon, white, gold). So, for this recipe, I chose foods that I knew everyone in the family could eat, in one form or another. I did chicken, carrots, gold potatoes, green beans, and baby spinach. Once you get your prep done, this recipe is a piece of cake. It just cooks on the stove while you do other things. I made this stew early in the morning during the baby’s nap (by the way, his morning naps are usually 30-45 minutes, so I knew it had to be a quick meal)! On this cool and rainy day, it just seemed like a good choice. Stew is a great comfort food on days like this one! Once it was done, I scooped out some vegetables (not the spinach) for the baby and smashed them well with a fork. Here is a photo so you can see the difference between our stew and his stew. Sorry it is such a close-up! I set aside some for the next few days as well. Everything was soft and smelled so yummy! Then I scooped some stew for my husband and I into some soup bowls. We all enjoyed this hearty and delicious stew for lunch! Although we didn’t have any on hand, you could always serve this with some nice bread or even a savory muffin (corn or millet for example). I can’t wait for leftovers! First you should prep your veggies. Peel your carrots (easier for the baby to eat, but if this is only for adults, leave the peels on if you want), chop into 1/4 inch rounds. Set aside in a large bowl. Peel and cut your potatoes into 1/2 inch square pieces. Set aside in the same bowl. Defrost your green beans in the microwave for 2 minutes, just so they aren't quite so frozen. Add them to your other veggies. Cut up your chicken into roughly 1 inch cubes. Add 1 Tbsp of oil to a large soup pot and turn your heat to medium. Toss in your chicken, season with a little of each spice in the recipe. Then let it cook for a few minutes until it starts to turn white, then a little bit brown on the bottoms (a little color is good when making meats!). 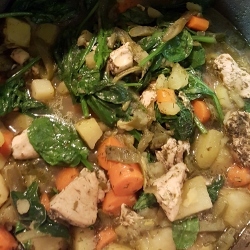 When the chicken is cooked on one side (you can check a piece or two to see), give it a stir and then add in all your other veggies except the spinach. Add in your remaining spices and seasonings. Put in the rest of your oil. Stir it with a large spoon or rubber spatula to make sure things are combined well. Pour in your 4 cups of water and cover. Let it cook on low heat for 30 minutes. It should have a gentle yet rolling boil once it gets going. If not, turn up your heat a little. After 30 minutes, check the carrots and potatoes for tenderness. They should be easy to smash with a fork. If they are done, great! Add in your spinach and let it cook on a very low flame for 3-5 more minutes. If they are not done, cook the stew for another 5 minutes, then test again. Repeat this process as needed. You can serve it immediately or you can let it cool for a few minutes before transferring (carefully) to a large container for storage in the fridge. This can be made vegetarian if you omit the chicken and substitute 3/4 cup of beans. IF you're making this for your baby (at least 7-8 months old, ready to chew of course), just scoop out the vegetables they have been exposed to and smash them really well with a fork. Then I recommend testing a little so you can see how hard it is to mash up in your mouth without using your teeth. The chicken is too hard for my son to chew at this point, but use your judgement with your own child. We gave him carrots, potatoes and a few little bits of green beans.